The share of rural households with major income from casual labour in agriculture decreased by 10 percentage points since 2011-12. That works out to a drop of 15 million families (from 36 million to 21 million) dependent on casual farm work (see chart). An estimated 3.2 crore casual labourers lost their jobs in rural India between 2011-12 and 2017-18, a 29.2 per cent slide over the previous survey. Of these, almost 3 crore were those working on farms. This translates to an over 40 per cent shrinkage in the casual farm labour workforce since 2011-12, according to the Periodic Labour Force Survey (PLFS) 2017-2018 report by NSSO which the government has declined to release. Casual labour refers to those employed from time to time according to exigencies of work. 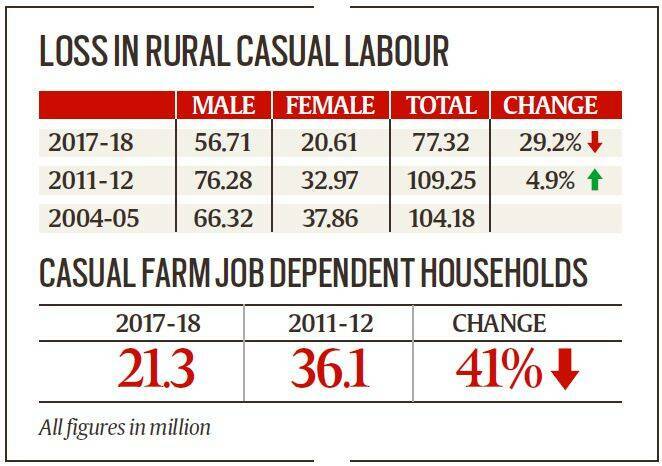 According to NSSO data, the rural casual labour segment — farm and non-farm — shows an overall slide of 7.3 per cent in male and 3.3 per cent in female employment since 2011-12. This adds up to a total employment loss of 3.2 crore. A bulk of this loss, almost 3 crore, was in casual farm labour since the fall in households dependent on non-agricultural casual labour was negligible (from 13.5 per cent to 12.9 per cent). The NSSO report, though approved by the National Statistical Commission in December 2018, is yet to be released by the government. Two members of the NSC, including its Acting Chairperson PN Mohanan had resigned January end protesting the withholding of the report. On Tuesday, The Indian Express published a report based on the PLFS 2017-18 and NSSO data stating that the national male workforce had shrunk from 30.4 crore in 2011-12 to 28.6 crore in 2017-18. Express cartoon by E P Unny. More rural men and women were employed in the regular wage/salary segment which jumped 31 per cent in the actual number of employed over 2011-12. But a small base meant that absorbed only 80 lakh more. In comparison, 1.9 crore were pushed out of rural self-employment and another 3.2 crore from rural casual labour. Together, the number of working people in the rural segment fell by 4.3 crore since 2011-12. 3 Top 5 sectors that need upskilling: How to stay relevant in age of disruption?